ASK OUR EXPERTS: Is Office 365 Right For My Business? | Central Business Systems, Inc.
Is Office 365 Right For My Business? 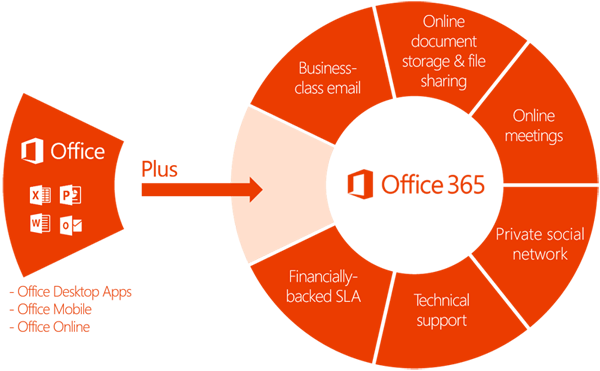 Office 365 is a low-cost cloud solution containing a suite of tools from Microsoft. The needs of your business will help decide what plan and set of tools are right for you. What should I expect with Office 365? The most common plan includes email and applications such as Word, Excel, Outlook, Drive, and Skype for Business. The Office 365 solution helps companies like yours to off-load the expensive cost to host email and standardize on versions of software like Word and Excel. Another hidden benefit is that each user can install Microsoft Office on up to five computers that he or she uses. Is Office 365 ONLY in the cloud? A common misconception is that Office 365 is a cloud ONLY solution. While some applications are in the cloud, others like Word and Excel are installed on your local computer. In this scenario the cloud still manages the licenses, user accounts, and license verification. Email, on the other hand, is a full cloud-based solution that eliminates the need for expensive on-premise servers and spam filters. Central Business Systems, Inc. will help you decide what plan is right for your business.